It was recommended that she be placed on supervised probation for six months. A TROUBLED 16-year-old girl, who was caught carrying a Taser stun gun, has been spared a custodial sentence after a court heard she has stopped offending. The teen admitted unlawful possession of the Taser weapon which is capable of injuring and incapacitating, in a public place in north Co Dublin on 30 August last year. The charge is under the Firearms and Offensive Weapons Act – she was aged 15 at the time. The girl, who cannot be named because she is a juvenile, faced a litany of charges for crimes which mostly took place last year and she appeared at the Dublin Children’s Court for sentencing today. A probation report on the girl, which had been sought earlier this year, was furnished to Judge John O’Connor. It recommended placing the teenager, who was accompanied to court by her mother, on supervised probation for six months. A social worker’s report on the teen had already been furnished to the court. Her solicitor Tony Collier said the girl is no longer offending and is staying away from the locations of the crimes. He said the interventions of the court and the Probation Service have had their desired effect. Judge John O’Connor said her charges, particularly assaults, meant the girl had been on the threshold of custody. However, he noted the probation and welfare report showed she has been doing well and progress has been. He decided to finalise the case and imposed the probation bond. This means the girl must continue to stay out of trouble and accept guidance from her probation officer to divert her from re-offending. In a quiet voice, the girl said she would comply. Breaching the probation bond means she would be brought back to court and a tougher sentence, including a term in custody, could be imposed. Her other charges included: producing a knife during an incident in October last year in north Co Dublin; assault causing harm to a male at a train station nearby; threatening to kill or cause him serious harm, and possessing a metal bar as a weapon on the same date. A guilty plea was also indicated to other charges: possessing a knife as a weapon on 26 October last at a shopping centre; assaulting two males, one of them a garda, on a date in September last, when she was intoxicated. These incidents also happened in north county Dublin. Other offences where guilty pleas were indicated took place in Dublin city centre in January. These were possession of a stolen silver ring worth €40 and a silver spoon valued €120 and theft of clothes worth €86 from a shop. A charge for possessing double brass knuckle-dusters on a date in November has been withdrawn. She is still awaiting trial over an alleged robbery. Comments are closed as a case involving the girl is before the courts. 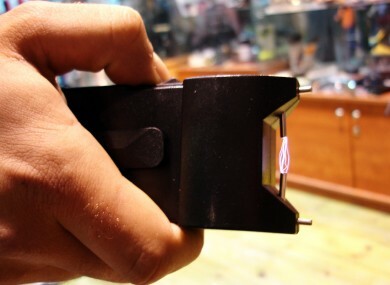 Email “Teen caught carrying Taser stun gun spared jail”. Feedback on “Teen caught carrying Taser stun gun spared jail”.